*HOT! * Cents of Style – 40% Off Dresses + FREE Shipping!! Cents of Style is offering an additional 40% off Dresses with FREE shipping! Use promo code FFDRESSES at checkout. Plus lots more awesome styles! CLICK HERE to shop! Cents of Style has 40% dresses with code DRESS18 at checkout + FREE Shipping! I like this Becky Tiered Sleeve Swing dress on sale for $34.95 – 40% with code DRESS18 = just $20.97 + FREE Shipping! *HOT! * Cents of Style – Extra 40% Off Dresses + FREE Shipping! Cents of Style is offering an extra 40% off dresses with FREE shipping! Use promo code DRESSFASHION at checkout! Multiple sizes/styles to choose from. For example, this Mabel Solid Fit & Flare Dress is just $21.57 after code DRESSFASHION ! Becky Tiered Sleeve Swing Dress just $24.57 after code DRESSFASHION ! Lizzy Solid Tiered Dress just $24.57 after code DRESSFASHION ! *HOT! * Cents of Style – 50% Off Accessories + FREE Shipping! Cents of Style is having a LAST CHANCE Accessories Sale where you can take 50% off the lowest price with promo code LASTCHANCE18 at checkout! Sweet! Shipping is FREE, too! Shop NOW for the best selection!! I love this Iliana Metallic Speck Beanie on sale for $14.95 – 50% with code LASTCHANCE18 = just $7.48 (reg $19.95) + FREE Shipping! Lots of colors! *HOT! * Cents of Style – 40% Off Dresses + FREE Shipping! Score 40% Off + FREE Shipping on DRESSES from Cents of Style! Use promo code FRIDAYDRESS at checkout. In regular and plus sizes, multiple styles and colors to choose from. *HOT! * Cents of Style – 25% Off All Clearance w/ Code + FREE Shipping! Cents of Style is offering an additional 25% off clearance items when you use promo code JANUARY25 at checkout! Sweet! Includes apparel, shoes & accessories. Plus, all orders ship for FREE! 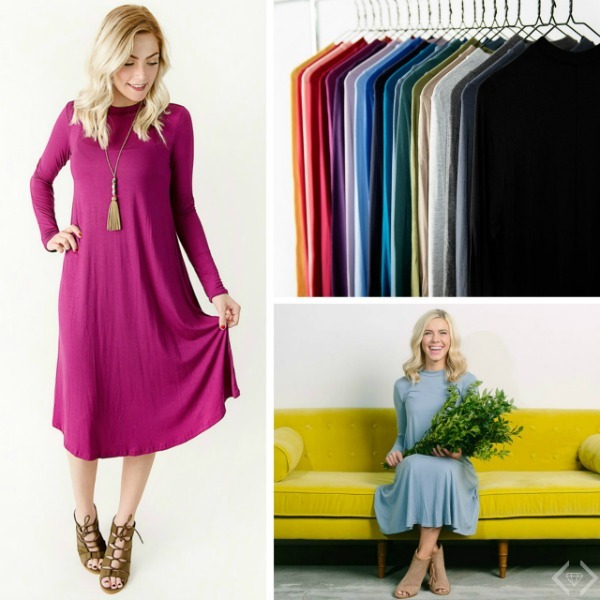 Cents of Style is offering the Becky Tiered Sleeve Swing Dress for $44.95 – $10 with code BECKYGIFT = just $34.95 with FREE shipping! Available in multiple colors and sizes XS-XL (fits sizes 0-18)! *HOT! * Cents of Style Dress Sale! REMI Swing Dress just $21.95 + FREE Shipping! Sizes S-3X in Lots of Colors! In my experience, if you want to fully cover your needs all around, this would work for someone approximately 5’4/5’5 or shorter. I’m 5’6 and at the sides where it goes up it basically skims the knee area. Of course, exact fit will depend on your personal shape/body type. You can also snag the Preston Dress for just $34.95 and the Brittani Dress for just $34.95 after code DRESS17 and these also SHIP FREE! *HOT! * Cents of Style – Floral Steals Starting at just $5 + FREE Shipping! TODAY ONLY! TODAY ONLY at Cents of Style, you can snag lots of awesome floral apparel & accessories starting at just $5 with FREE shipping! Use promo code FLORALSTEALS to get a 20% discount on these items, many already on sale! For example, snag this Kambree Ultra-Soft Floral Skirt for $18.95 in 3 colors, sizes S-L —> just $15.16 after code FLORALSTEALS at checkout! Florence Floral Infinity Scarf for $6.95 in 3 colors —> just $5.56 after code FLORALSTEALS ! *HOT! * Cents of Style – 10 Items for $10 Each with Code + FREE Shipping! Cent of Style is offering 10 awesome items for just $10 each!! Use promo code BIRTDHAY10 at checkout. Includes apparel, shoes and jewelry items. *HOT! * Cents of Style – $10 off $20+ Purchase + Clearance Bargains + FREE Shipping!! Cents of Style is offering $10 off your $20+ purchase, valid on clearance items!! Click Here to shop NOW for the best selection of styles and sizes! Use promo code 10OFF20 at checkout, plus your order ships for FREE! *HOT! * Cents of Style – 2 for $15 Pendant Necklaces + FREE Bracelet + FREE Shipping!! Cents of Style is offering 2 fabulous pendant necklaces for just $15 with code 2FORPENDANT at checkout! PLUS, when you hit “Checkout” from your shopping cart, you will be prompted to pick a FREE bracelet as well – Sweet!! And your order ships for FREE!! Cents of Style – Floral Skirts Just $19.95 + FREE Shipping (after code)! Cents of Style is offering lots of fabulous Floral Skirts for just $19.95 + FREE Shipping! Use promo code FLORALSTORY at checkout. *HOT! * Cents of Style – Extra 50% Off Warehouse Sale + FREE Shipping!! Cents of Style is having a Warehouse Sale with lots of great items eligible for an additional 50% Off! Use code SPARKLESALE at checkout. Plus, your order ships FREE! Choose from 6 pages of awesome hats, gloves, scarves, shoes jewelry and lots more great accessories at rock bottom prices! I Can’t Even Trucker Hat –> just $4.98 + FREE Shipping after the code! Anjelica Layered Chain Necklace –> just $7.48 + FREE Shipping after the code! Nadine Faux Fur Scarf –> just $7.48 + FREE Shipping after the code! Earmuff, Headphones, & Glove Set –> just $4.98 + FREE Shipping after the code! Cents of Style – 2 for $22 Tops + FREE Shipping! Cents of Style is offering 2 for $22 Tops with FREE Shipping! Use promo code 2FORTOPS at checkout to get this deal. *HOT! * Cents of Style – $13 Off Lowest Marked Price for Dresses + FREE Shipping!! Cents of Style is offering $13 off the lowest marked price of all their dresses with FREE Shipping! Use promo code LUCKY13 at checkout to get this deal! The very popular Remi Long Sleeve Swing Dress is included in this sale at $34.95 – $13 with code LUCKY13 = just $21.95 + FREE Shipping! Lots of colors in sizes Small (0/6), Medium (6/8) and Large (10/12). Please note that the skirt tag on the seam has a Christian message so you may want to remove that (just snip it off) before wearing. And this Amy Long Sleeve Striped Swing Dress is $30.95 – $13 with code LUCKY13 = just $17.95 + FREE Shipping! *HOT! * Cents of Style – 50% Off All Wraps & Scarves + FREE Shipping! Baby, it’s cold out there! Cozy up with these chic wraps and scarves at Cents of Style for 50% Off + FREE Shipping when you use promo code SCARFGIFT2 at checkout! *HOT! * Cents of Style – Earmuff, Headphones, & Glove Set just $5 (reg $44.95) + FREE Shipping! Cents of Style is offering the Earmuff, Headphones, & Glove Set for just $5 with FREE shipping!! Say hello to these adorable earmuff headphones! And did I mention they come with matching touchscreen gloves? One size fits most. Knit sweater wired earmuffs with speakers. Fur trim detailing. And a pair of touch gloves! Earmuff- 80% Acrylic, 20% Polyester. Gloves- 88% Acrylic, 2% Polyester, 2% Spandex, 8% Other Fibers. *HOT! * Cents of Style – Earmuff, Headphones, & Glove Set just $7.95 after code (reg $29.95) + FREE Shipping! Cents of Style has a fabulous promotion today! Get the Earmuff, Headphones, & Glove Set for just $7.95 with FREE shipping when you use promo code EARMUFFS at checkout! Reg $29.95! Say hello to these adorable earmuff headphones! And did I mention they come with matching touchscreen gloves?